Bertha Blanco in the office of the National Federation of Campesina Women of Bolivia, in La Paz, Bolivia. (Click to see larger image). All photos by Nic Paget-Clarke. 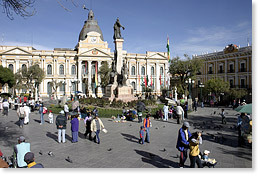 Murillo Plaza, downtown La Paz. The building on the left is the Congress; the building on the right the Presidential palace. 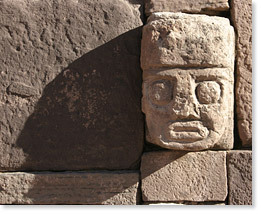 One of many faces on a wall at the Kalasasaya site of the ancient Tiwanaku civilization, Bolivia. 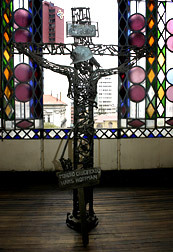 "Minero Crucificado" (1998-1999) by Bolivian sculptor Hans Hoffman, Museo de Arte Contemporaneo Plaza, La Paz. 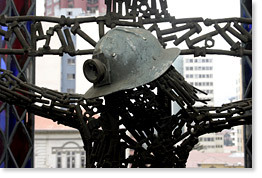 Composed of bolts, nuts, and a miner's helmet in commemoration of the IMF-inspired lay-offs of 20,000 miners and closing of many tin mines in the mid-'80s. Many of the residents of El Alto moved there after the mine closings. (Click to see larger image). 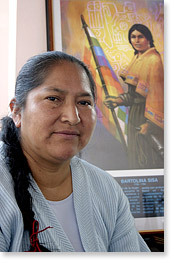 Bertha Blanco is a member of the National Federation of Campesina Women of Bolivia / Bartolina Sisa. This interview was conducted (and later edited) by Nic Paget-Clarke for In Motion Magazine on September 7, 2006 in La Paz, Bolivia. The interview was conducted in Spanish, transcribed by Elena Carrillo, and translated into English by irlandesa. In Motion Magazine: Do you know how many people there are in the entire organization? Bertha Blanco: It might seem as if there aren't any, but when we hold a seminar, just a subcentral, three hundred or four hundred might come. When we hold one in a community, the entire community can get together. When there's an assembly, for example, all the men and women come. 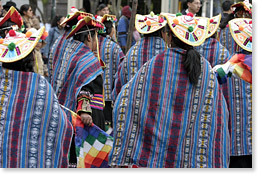 The organization is odd; it represents all the organizations from every community in Bolivia. Each province has their assemblies, their ampliados, both ordinary and extraordinary. When a serious problem occurs, an extraordinary ampliado is convened. The ordinary assemblies are held every two or three months, depending on how the area is organized. There they report on everything that is happening, like a chain, since we don't have any means of communication. We would like to have a radio, we could reach the women more quickly that way, but, since we don't have any means of communication, it is through the organization -- national, departmental, provincial, subcentral. That's how it gets everywhere. On September 5, we remembered the death of Bartolina Sisa. It was two hundred and twenty-five years ago, and we placed a stone in order to erect a monument to Bartolina Sisa and Tupac Katari. We wanted to change the monument in Murillo Plaza, because Murillo was one of the people who beheaded Tupac Katari. We are going to change it. That is why we placed a foundation stone in the plaza. Bartolina Sisa and Tupac Katari should be there. The president should obey what the organizations tell him. He has a responsibility to a mandate. The Assembly is our maximum authority, and the person who is president should obey what the bases tell him. Next year we have to put Bartolina Sisa and Tupac Katari in the Plaza de Armas. Murillo will leave, and Tupac will go in. That is our proposal from the Bartolinas Sisas. From now on we want the history of our ancestors, of the true liberators of the indigenous peoples -- Zarate Willca, Tupac Katari, Bartolina Sisa, Micaela Bastidas, Tupac Amaru, who are our leaders. They are going to have to begin being written into history, because they have erased everything. There is no history, and we are going to compile it once again. As for fair trade, here in Bolivia we have analyzed the free trade treaty quite a lot, the opening of the borders. And when the borders have been opened to trade, this has led to the decline of production in Bolivia, agricultural as well as industrial and artisanal. Opening the borders allows other countries with large-scale machinery to introduce their products at very low prices. Here in Bolivia, for example, a soft drink that comes in from another country costs 2.50 bolivianos. 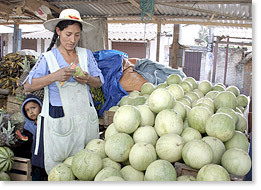 The cost of production in Bolivia comes to 5 bolivianos. This leads to the consumption of the cheapest product. The cost of production in other countries, because of their machinery, leads to the product coming in and being cheaper. Since Bolivian production is more costly, it leads to the people buying the least expensive and the breakdown of the countrys production. we grow exquisite, high quality, floury potatoes, with their own taste and the very sweetness of the earth, with natural fertilizers. But big, pretty potatoes are coming in from Argentina and Peru in large quantities. They are made with chemicals, and, as I said, we have our small potatoes, sweet and floury, but at a slightly higher price. This is because they are made by hand, not with machinery. They are grown with natural fertilizers, not with chemicals. And since they enter in large quantities, the potatoes from Peru and from Argentina are less expensive, and the Bolivian product turns out to be very expensive. The Bolivians are then forced to lower the price of potatoes, although the quality is no longer the same. The disappearance of natural potatoes is being threatened in Bolivia, with the introduction of all this chemical treatment. This is what free trade is also bringing: cutting our costs and ruining the quality of our ecological products. We are proposing to fight for food sovereignty because if chemically grown products come in from Argentina, they are going to damage people's bodies. We have to protect our products, to fight for "food sovereignty" and to protect everyone from all the chemicals from other countries like Argentina, which has a lot of industrial chemical development, even with wheat. From that viewpoint, we see that Bolivia is proposing the Trade Treaty of the People. The Trade Treaty of the People means exchange and barter, according to our needs. For example, if I live in the Alturas, I have meat, I have dried beef ("jerky"). If I live in the valleys, I have oranges, plantain. I can take them to the Alturas, and we would make exchanges. We barter products. I can sell oranges here, they bring dried beef, potato flour, quinoa, then we exchange amongst ourselves. It would be much better to be able to exchange healthy things throughout Latin America, at least among ourselves. We are going to continue practicing the Trade Treaty of the People, based on the exchange and barter of many healthy products, like quinoa, which has many more proteins and which is being exported for its nutritional value. If you go to Ancoraimes on Sundays, you aren't going to see money, but there is a market. Some people bring fish, and some bring potato flour, and they exchange them. An evaluation is made, about more or less the cost of the exchange according to the work carried out. Fish is brought from the lake, and the person who grows peas, cereals, knows how much effort he put into his work and, according to that, he knows how many fish correspond to a full plate of beans. Even though they live differently in the city, barter exists, and that is what has been proposed. Compañero Evo Morales (president of Bolivia) knows hes not in agreement with the TLC (Free Trade Treaty) because it does us harm. That is why he has proposed what the organizations have defined as the Trade Treaty of the People. It is a kind of coexistence in which the organizations engage among themselves, and which we are putting forward as a political proposal. We are now promoting fair trade, which involves recognizing the person for the work and for the effort in way that is fair. He has to be compensated, fairly paid. Normally, there are intermediaries who are the ones who sell, and then it passes to other hands and they continue to speculate about a product. What we want is being put into practice, from the producer to the consumer. That is being done now with coca leaf. It is the producers themselves who are taking it to the Altiplano and engaging in barter. In Motion Magazine: Would you like to talk about the role of the United States in Bolivia, such as in the '70s? Bertha Blanco: I think the United States has done a lot of harm to Bolivia since we don't share the practice of capitalism. 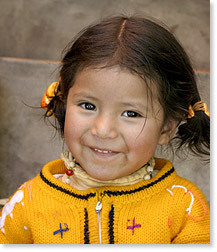 We are part of the Andean cosmovision, where life is shared with all living beings. All beings feel, plants have ears. Animals give us their meat, their wool, in order to coexist among ourselves, sharing with each other but without exploiting anyone. For example: a dog takes care of the house, he provides us with a service, and we should also take care of him. We should give him food, protecting him and taking care of him. He is performing a job. The same thing happens with our products, which we have to take care of because we live off them. It is Mother Earth who gives us the products, and so we have to care for the land, the earth, the place where the product that feeds us is going to grow. For us this is coexistence, with reciprocity, between Mother Earth and man. There is great respect for Mother Earth, Pachamama, because she gives us life. The water, the natural resources, come from her. And, as she gives to us, she also takes away. In capitalism the only one who is noticed is the one who has money. It doesn't matter if people have to die. That is the purpose. That is what sets us apart and separates us above all else. On the other hand, in the Andean cosmovision, the purpose is man. Mother Earth brings us in order to live well. Man should live well on the earth, and he should share everything he has in order to live well, because all men are here as transients. Not even the greatest millionaire in the world can have a double life. He only has one, and he only has one opportunity to live well. I think that down deep men must have a spiritual side and a material side. But perhaps some persons have developed just the material side, and that culminates in what is known as capitalism. So no one can ever live well if he exploits his brother. How could I live well? I cannot live well. That is why I think the United States has developed in the world and has been identified in the world as a capitalist country, which only wants money and power, to be master of everything. That is how a capitalist country is. There are great differences between the thinking of the Andean man and thinking in the United States. However I believe that not all brothers share that outlook. I think there are people who have very much developed the sensitive spirit of solidarity and of what sharing is. But others have developed the material part more, and they will live well, but they havent thought about their brothers. I think that all rich people should think about their brothers, not just about themselves. They should not be egotistical. They should think about their conscience. They are mortal too, and, if they are going to die, where will they be? At least a man, a woman, in solidarity, will remain in everyones thoughts, like our Bartolina Sisa in Latin America. I think it also has to be like that in the rest of the world. Throughout history we have always been producers of raw materials, and all our tin has gone to the United States. Despite having produced so much tin, Bolivia has remained a poor country. That is why it is said that Spain has taken the gold and silver, and the United States has taken the tin. The United States has always wanted to demonstrate that power. You still see it. A few years ago, the ambassador even spoke for us, talked for us. I believe every state has its liberty and its autonomy. While there are brothers who come here to Bolivia to share, they should share and not decide for us. That is why I think society also has to change and to learn to say "brother", to recognize its brothers, because if we don't recognize them we are going to be egoists and individualists where one person alone can want to be and to have the entire world in his hands. And it cannot be like that. We are many brothers, and we have to look out for the collective interest if we want to live well. No one is immortal, all of us are going to die, even the richest, even President Bush of the United States. Everyone has their path, their destiny and they have the opportunity to be able to change and to think about their brothers. I feel sad when I see that in Iraq and other countries they are still killing people. The weapons factories have to disappear. Why keep on killing? How can they talk about ethics, about morality, about brotherhood, about recognizing your fellow man, if people are being killed? So how then can we allow weapons factories? For whom? To kill whom? I think this should stop. The President has to think about his brothers in the world, not just about his brothers close to him. I also think that there are many areas in the United States itself where people are suffering, and he has to think about even the last of his brothers in the world, not just about a small upper echelon, like the small upper echelon that also exists here. That is why the people have decided to do away with these small groups, seeking to look out for the interests of all the brothers of the world. That is what we have wanted, and that is why we have suffered and wept so much. Goni (Gonzalo "Goni" Sanchez de Lozada), the previous president, is even still living in the United States, despite the fact that we have gone and held meetings and demonstrations at the United States embassy, asking them to return that man. He has to answer for the lives from the Gas War, but even so he is still being harbored and protected by the United States. There are children who cry because they have nothing to eat, because their mothers have been left with eight children, with five children, with six, and they cannot support them. All those children, those destroyed families, are demanding their rights, and President Bush doesn't say anything. He should send him here to us now, so we can also have justice. The United States has a lot of influence. I am not saying the entire population. I believe the people do not have the same feelings as the President. But when one votes, one has to think about which person is being voted for and, above all, whether that person is going to represent the principles they want. Sometimes we have also learned from the attacks, from all the blood. As well as how they deceive us with pretty words in the campaigns when they say they are going to give us everything, but, when the time comes, it's just the opposite. Now we have learned, and we have chosen to vote for ourselves. I think that in the United States they are going to have to think about who to vote for, who to give their vote to, if they really are sensitive, if they are humanitarians. Because it is not money that says whether or not you are humanitarian. The person to whom we give our vote has to be in solidarity, has to be humanitarian, has to look out for the interests of everyone, not of a small group. Selling melons in Santa Cruz department. Young girl, daughter of a small-shop owner , in the Mercado de Hechicería, La Paz. Dancing and marching through downtown La Paz in support of education, to overcome poverty. 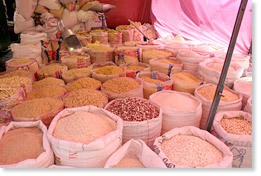 Beans, pasta, grains at the El Alto market. 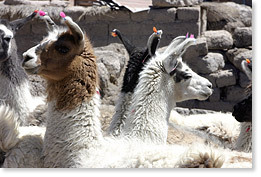 Llamas at a bi-weekly market in the town Curahuara de Carangas in Sajama province, Oruro departament. 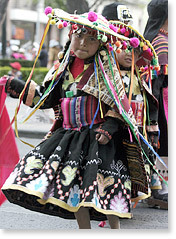 Another scene from the march/dance for women's/chidren rights, downtown La Paz. A group of women participants dance by. In Motion Magazine: What does Bartolina Sisa think about land reform? Bertha Blanco: According to the beliefs of our indigenous peoples, land is identity. Man cannot live in the air. Man lives in a particular territory with its customs and traditions. Bartolina Sisa and Tupac Katari fought for that. When the Spaniards came the indigenous peoples were left completely without territory, without land, without identity. And what they (Bartolina Sisa and Tupac Katari) wanted to do was recover it, because thousands of men and women cannot live without identity. We have to make that identity be respected, and we have to recover it. That is what we have fought for. They left us their idea quite clearly: that we are a people without identity because at this time we do not have our territory in our hands. That is why we are trying to get there and, by taking on a political arm, we have entered into power, and from power to the Constituent Assembly, in order to forge a new restructuring of lands. A few people cannot have expanses of land, which were distributed when they were part of the political power, when they took hold of the map and marked out the lands where they were owners. There has to be restructuring now and a distribution of lands, but according to needs. There are many compañeros without lands, and this cannot be. There are some who do not work the land, but they are the masters. The land has to be for the one who coexists with it. This Andean people have to recover it. That is why studies are being made so that there can be new reforms here in Bolivia. It has to be. So many brothers should not be going to other countries, even to the United States. How many Bolivians are going to Spain, to Italy, Japan? Why? Because there is no place to live or way to live. That is why there has to be a new reform so that our brothers do not go and they will be able to live well on this land. That is why there must be a new redistribution of lands, which should be approved in the Constituent Assembly. In Motion Magazine: What is the situation for women? Bertha Blanco: As Bartolina Sisa, we have not been able to work on the issue of women, because the enemy was mutual for both (men and women), for the indigenous people. What was important was to free ourselves then, and we couldnt think about whether women had to free themselves from men or not. Our identity had to be defended. That was our struggle from the first. Inside our struggle, they talk about "chacha warmi" where both men, as well as women, decide. With the influence of the city on society, machismo has been increasing. We have not been involved in the issue of women, but we have looked at the state structures of the previous governments where there were just men. If you go to the government palace, to the parliament and senate, and look at the photographs of all the deputies, they are just men, with none of our indigenous people participating. Now you can look at the Constituent Assembly, there is a woman who is from Bartolina Sisa. There is a place for us. But what we want now is to be in the Constituent Assembly with our proposal for the indigenous peoples, which has been analyzed in all the national organizations, the CONAMAQ (Consejo Nacional de Marcas y Ayllus de Qullasuyu), el CIDOB (Confederación de Pueblos Indígenas de Bolivia), la CSUTSB (Confederación Sindical Única de Trabajadores Campesinos de Bolivia) and the Bartolina Sisa Federation of Women. We have held meetings all this year in order to make the proposal real in the Constituent Assembly. And there we have proposed -- as Bartolinas, as women -- the participation with gender equity in all political spaces, unions, social and public organizations, insisting that women have the same rights as men. When there are only men in a government, it's not right, something is wrong. In addition, men have a different way of thinking, and women have a different way of thinking, and the two are complementary. If not, there would not be couples in the world. So women think differently, and that is why I think there should be gender equity in a government, in all parts of the world, because women have rights just as men do. So, as Bartolina Sisa, we think there has to be gender equity everywhere, and there should also be participation and access to natural resources. It is true that we have experienced moments of exclusion, exclusion between men and women. We were not able to participate in the organizations, because women are always more excluded. But at certain moments in the struggle, you have to look at the Right wing and the indigenous peoples. You have to look at your position. You cannot still be fighting for gender rights. You have to fight for the rights of the indigenous peoples, and that's what we have seen as women. We have fought for the greater rights of the indigenous peoples. Today we are proposing gender equity in the Assembly so we wont be fighting among men and women. By having equity in the executive branch, in the social arena, in unions, we will be applying and complementing the meaning of Chacha-warmi, that is, achieving participation with gender equity. That is what we have proposed in the Constituent Assembly, and it has also been supported by the men's organizations. In Motion Magazine: Would you like to talk a bit about the president? For me, he was a boy who suffered from social problems, for example: during the period of the failure of the mining industry, the tin, there was a lot of relocation, and all the miners were left without work. They gave them their severance pay, and later they had to adapt wherever they could. Here in the city of El Alto there are many mining areas where they have come to live because there was no longer any work in the mines. Don Evo Morales came to live in the Chapare, because he had nowhere else to go. He made his farm here. It is difficult and hard to live in Chapare, but you can live with dignity if you plant plantains, grow pátano. If you plant yucca, you will be harvesting it in six months. Rice is already producing in three months. The soil produces a lot, you can live and you can grow food in a very short time. For example, there is the "noventón" which means that in ninety days its already producing fruit. The land is very good. However, if you live here in the altiplano or in the city, you dont know whether or not you're going to have work. So people go where they're sure they're going to feed themselves. I think many people have gone to Chapare to live, in order to eat and not to be begging. That is why they have bought their farms and cultivated what there is: coca, plantain, rice, yucca, citrus and everything else that can be grown. We also grew, my mother grew more vegetables. She planted cucumbers, tomatoes, Rocoto peppers, everything that's in the valleys. My mama grew them, and she sold them to the people who grew coca or rice. Later on we also went into growing rice. He (Evo Morales) has a brother and an older sister, Doña Ester, who has been like his mama. His parents had apparently died earlier. They were left orphans, and the eldest sister took charge of them. I knew him in the organization. We have seen him all the time, ever since he was young. He didn't have a wife. The leaders are usually devoted to the organization. They are at the service of the organization. He has lent his services for many years to the Trópico de la Cochabamba organization, to the cocaleros who have suffered from much persecution because of coca ever since the Law 1008. Previously there were not any drugs in Bolivia, and ever since they began being grown, the coca producers have been destroyed, especially in the countryside, those in the east as well as in the west. Everyone chews coca: at work, at night, a chew during work, when you go to work or at work, in the morning, in the afternoon, at noon, they always chew coca. Everybody, everyone who has his field has his little bag of coca. With 1008 they began punishing the coca leaf and the people. Now they cannot produce more or buy more than just a specific quantity, because now its against the law. But they made a bad policy. The United States has also had to do with seeing to coca not being produced, thinking about the quantity of drugs that are consumed in their country. But we have never produced the drug. It has been the big drug traffickers who have made that use of it, and they are not being punished for that. For us, coca leaf is for chewing. If you chew it, it does not do you any harm at all. It is something normal in any home, in any part of the countryside, in the east as well as the west. If you go to the countryside, they are always chewing their bit of coca, and this has brought many problems because it's part of our Andean cosmovision. When we have to pay our favor to Pachamama, we always do so with a little coca leaf. It's like in the Catholic Church; they partake of the host, which is a means to meet God. For us as well, it is in order to meet with our Pachamama, as an expression of gratitude. That is why we say the coca leaf is sacred. But they have made it a drug, and they have done us a lot of harm with that. The persecutions began, and I think that is why compañero Evo organized everyone who grows it and why they have organized in defense of coca. He gained power and became president by defending coca because he is a man who does not give in. He knows that it's not right to penalize coca leaf, and he has been persevering in his convictions which he has struggled for, and he has never given in. He has always been faithful to the organizations, and that is why he is so appreciated. He has never betrayed us, and I think he is not going to betray us when he is in government either. In Motion Magazine: Lastly, would you like to talk a bit about the artisan organization? Bertha Blanco: I have been in Bartolina Sisa for two years, and since Ive lived here I have begun making friendships and collaborating in one of the parishes in El Alto. They have given me the opportunity to organize groups of women here. Here I have seen the problem of poverty, the lack of sources of employment, the problem of not being able to secure financial means in the city in order to be able to support a family. So the man goes to work, and he may find work or he might not, but when you have a family, you can't say there isn't any money, you have to cook every day. So that is why we have begun organizing groups of women. We have given them the name of Pachamama Association. Pachamama, because it is she who gives us things to eat in the city. Then we formalized the organization as the Pachamama Solidarity Association of Artisans. We began with alpaca and sheep woolen fabrics, teaching and producing sweaters, tights, caps and gloves. At one point we had 300 persons. Depending on the orders there could be 70, 80, 100 of us. When there are no orders, there are 35, 50 of us women. We meet every Tuesday. I'm not going a lot now because of a lack of time, but everyone meets on Tuesdays, like an assembly. Here we see if there are any orders, we make new designs and we train ourselves. Whats lovely is that it is a permanent meeting so that we don't lose touch with each other, so we can still be individuals together. We have begun making alpaca knit goods, we've spun and we have knit. We've gone out and sold them here in the artisan areas. We give credit, and later they pay us. We pay the labor with that, putting one part into the capital fund in order to buy wool. And so we have a capital fund for wool and a capital fund for labor. Once we sell it, we leave the capital and we pay for the labor. We don't have a big market, and we had opened a shop here in the artisan area, but we've closed it now since there have been so many factory closings, and that has created a lot of unemployment. Many people have been working in crafts, and the prices have gone down. It's no longer possible to pay the rent on a business because the area has also become very expensive and we can't cover the costs of a business -- we were paying $250 for a shop. And so we've stopped selling. But we have had contacts with fair trade in Italy, who are the ones who are now giving us work. What is our goal? To not have intermediaries. Instead of the intermediary making money, we would prefer the compañeras to be making it. On the other hand, we also don't charge a lot so there will be more sales and that way well have more orders. That's what we're doing now. This year we had a lot of orders from Italy, but we haven't put more on offer, because we're afraid of not being able to deliver. When they give us an order, we have to fulfill it, so this year we had a good order, and the people have been happy because there werent any intermediaries. On the other hand, they have given us courses in designs, models, colors, and that has also opened our minds a bit. We were a little close-minded regarding new sketches, designs, sizes which arent the same as sizes in other countries. For that reason we have received training courses which have helped us quite a lot. Now what we are seeing is the possibility that as a group we can have a market. We want to open more spaces in our organization in order to help others in other departments in Bartolina (editor: Bolivia is divided into departaments). Although we often don't have much space -- that is, there is union and organizational work -- we see we haven't grown at the productive level of the rest of Bartolina Sisa. We are seeing the possibility of tying everything together -- the productive, the artisanal -- channeling it in that way with fair trade directly. Although it is still just an idea. Bertha Blanco: You are welcome. Hopefully our experience might be useful for other countries who are perhaps more developed than we are. But from a human and social perspective, I think we have a lot of organizational ability in Bolivia, more than in other countries. We're very tied to the organization. We even organize to sell stones. We don't stay still, whatever it is, the leaders always come quickly and organize wherever we are. Our task is organizing. It's good to be organized, because that's the only way we will be able to do politics. We never used to get involved in politics, just in the organization. But when we see so many things, we have said: "It's time to take responsibility for political decisions as well." It's important, yes. Our very best wishes to all our brothers who are going to listen to our testimony from Bartolina.